For other people named Mark Noble, see Mark Noble (disambiguation). Mark James Noble (born 8 May 1987) is an English footballer who plays as a central midfielder and is captain of West Ham United. He has played almost all his youth and first team football for West Ham apart from two short loan spells, at Hull City and Ipswich Town. He has played for England at U16, U17, U18, U19 and U21 levels. He captained the U21 side, scoring three goals in 20 appearances. Noble is the longest serving player in West Ham's current squad, having been in the first team since 2004. He is West Ham's first-choice taker for penalty kicks and has won the club's Hammer of the Year trophy twice. In 2014, he was ranked in the top five penalty takers in the top European leagues and was in the top 10 in the world based on the percentage of penalties successfully converted since 2009. Noble has played more Premier League games for West Ham than any other player. Born in Canning Town, East London, Noble played for Barking Colts and moved to Arsenal's academy at age 11. His father, however, who would drive him to training, could not always arrange the time to get Noble to training sessions due to the distance from their home in Beckton. Local side West Ham United showed an interest and Noble signed as a youth player. He became the youngest player ever to appear in their reserve team, aged 15. He became a trainee in July 2003 and made his debut in the senior team at the age of just 17 in the League Cup in August 2004 in a 2–0 win against Southend United. He made his league debut in the Championship in January 2005, in a 4–2 defeat away at Wolverhampton Wanderers. 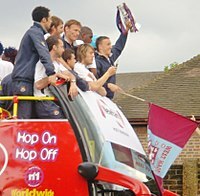 On 30 May 2005, Noble played in the 2005 Football League Championship play-off Final which saw West Ham beat Preston North End 1–0 to secure a return to the Premier League. He had entered the game as an 82nd-minute substitute for Shaun Newton. Noble won the Young Hammer of the Year and the runner-up to the Hammer of the Year awards despite making his debut only four months previously. Upon West Ham's return to the Premier League, he featured in only five League games in the 2005–06 season, including those against Tottenham Hotspur on 20 November 2005 and against Manchester United on 27 November, but after a game against Blackburn Rovers on 10 December, he found regular playing time harder to come by and was sent out on loan. He did not play for West Ham at all in 2006. Noble was subsequently loaned to Hull City where he made five appearances. His Hull debut came on 18 February 2006 in a 1–0 away defeat by Cardiff City. Noble's loan ended early after he suffered an injury to his lower back. Noble signed a three-month loan with Ipswich Town in August 2006 in the hope of gaining necessary first-team experience. He played 13 games in the Championship and scored his first professional goal on 12 September in a 2–1 home win over Coventry City. Noble scored his first goal for West Ham against Brighton & Hove Albion, the side's first of three in a 3–0 home win in January 2007 in the third round of the FA Cup, from an assist by Carlos Tevez. On 4 March, he scored his first Premiership goal and the opening goal of the game, against Tottenham at Upton Park in a game West Ham eventually lost 4–3 in the final seconds. He played 11 games in all competitions, scoring three goals in the 2006–07 season. Noble established his place in Alan Curbishley's side during the 2007–08 season, starting nearly all games when fit. He scored his first penalty for the club on 18 August 2007 in a 1–0 away win against Birmingham City after Colin Doyle had fouled Craig Bellamy. He was out for several weeks in November 2007 after he had played through an injury for the last several months without letting the medical staff know. In January 2008, Noble scored the only goal in a 1–0 victory over Liverpool from the penalty spot, after Liverpool defender Jamie Carragher had brought down Freddie Ljungberg in the last few seconds of second-half added time. His performance in the match was described as "exceptional". The 2008–09 season did not start well for Noble, as he was sent off for two bookable offences in a 3–0 loss away at Manchester City, the first away game of the season. After serving his suspension he came back to score an equaliser against West Bromwich Albion after West Ham went a goal down with West Brom coming back to win 3–2. This was one of five goals he scored in the season with three coming from the penalty spot. After Alan Curbishley left in September, he remained in the first team under new manager Gianfranco Zola. He celebrated his 100th appearance for the Hammers by scoring against Blackburn at Ewood Park on 21 March 2009 to secure a 1–1 draw. In April, he signed a contract extension tying him to the club until 2013. Noble began the 2009–10 season well, scoring West Ham's first goal of the new season, in a 2–0 win over Premier League newcomers Wolves. Under Gianfranco Zola, Noble established himself in central midfield in a diamond that included Scott Parker as his partner and Jack Collison and Valon Behrami on the wings. He would only score one other goal during the season – a penalty after Habib Beye had fouled Zavon Hines – in a 2–1 home win against Aston Villa on 4 November 2009. With West Ham now managed by Avram Grant, Noble continued to be a regular member of the first team. He played 26 of a possible 38 games in the Premier League missing a month of the season after an appendectomy as West Ham were relegated after finishing in 20th and bottom place. He scored four league goals, all were penalties including two in one game. On 2 April 2011 against Manchester United his two penalties had put West Ham 2–0 up only for Wayne Rooney to score a hat-trick which, with another goal by Javier Hernández, won the game 4–2 for Manchester United. During the 2011–12 season with West Ham now back in the Championship, Noble scored eight goals, seven of which were penalties, his only goal from open play coming in a 4–0 away win against Barnsley. Having twice previously been runner-up, Noble was named Hammer of the Year for the 2011–12 season. In May 2012 Noble played in the 2012 Football League Championship play-off Final at Wembley Stadium against Blackpool which West Ham won 2–1 to return to the Premier League after a one-year absence. By the end of the season, he had played 49 games in all competitions, missing just one of their Championship games. In September 2012, Noble signed a new three-year contract with an option for a further two years. In February 2013, he was out injured after having been diagnosed with a compression of the thoracic outlet. He did not return until 17 April 2013 in a 2–2 home draw against Manchester United. The missing games saw Noble's tally for the season at 31 games in all competitions with four goals scored. Three goals were penalties with his one-goal from open play coming in a 4–1 home win against Southampton on 20 October 2012. Noble scored three goals in the 2013–14 season, the only one from open play being the second goal in a 2–0 away win over Cardiff City in January, despite the team being down to ten men after a James Tomkins sending off. 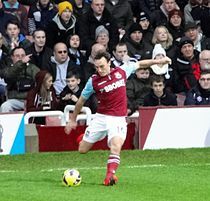 On 6 May 2014, Noble received his second Hammer of the Year, beating runner up Adrián and third-placed James Tomkins. On the same awards night, Noble also won the Players' Player of the Year accolade. Noble missed a penalty in a 0–1 home defeat by Tottenham on 16 August 2014, the opening game of the season, but scored his first goal of the season in the next home game, on 30 August, a 1–3 home defeat by Southampton. On 29 November 2014, Noble became West Ham's record appearance maker in the Premier League with his appearance against Newcastle United being his 205th Premier League game, overtaking Steve Potts. Noble signed a contract extension which would keep him at West Ham until 2020, with an option for a further year, on 26 February 2015. Noble's first goal of the season came from the penalty spot in a 3–4 home defeat by Premier League newcomers, AFC Bournemouth on 22 August 2015. The following week, he scored the second goal in a 3–0 away win against Liverpool; this was West Ham's first win at Anfield since 1963. Noble made his 350th senior appearance for West Ham on 6 February 2016, in a 1–0 defeat away at Southampton. The following week, he scored his third goal of the season, netting West Ham's equalizer in the 77th minute of their 2–2 draw away at Norwich City. On 22 December 2015, it had been announced that Noble was to be granted a testimonial by West Ham following his long service to the club. The game was played on 28 March 2016 between a West Ham XI and a West Ham United all-stars team made up of former players, with all proceeds going to charity. The game was won 6–5 by the West Ham XI in front of 36,000 spectators and featured a goal by Paolo Di Canio and two by Dean Ashton, including a bicycle kick described as "stunning". 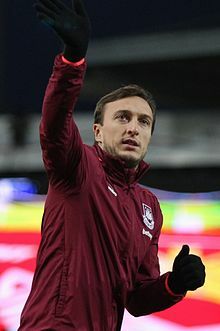 On 10 May 2016, Noble became the final man to lead a West Ham United team out at Upton Park, as the Hammers went on to win their final game at their former home 3–2 against Manchester United. In March 2017 sections of West Ham supporters called for him to be dropped from the team. Noble described the season as "the most difficult of his career". On 8 April 2017, having played against Swansea City, Noble marked his 400th appearance for West Ham becoming the 19th player to pass this number. He played 35 games in all competitions for West Ham in the 2016–17 season scoring five goals, two in the Europa League and three in the Premier League. His season finished early with two games remaining for West Ham as he required an abdominal operation. Noble marked his 300th Premier League appearance with a goal from the penalty spot against Stoke City on 16 December 2017. In March 2018, there were protests against David Sullivan and the West Ham United board at the London Stadium during a 3-0 home defeat to Burnley. There were four pitch invasions with one fan approaching Noble on the pitch. In scenes described as "horrific", Noble grappled with the supporter, throwing him to the ground. On 5 May 2018, he scored the second goal in a 2–0 away win at Leicester City, a result which ensured West Ham's survival in the Premier League. Noble described the goal, a volley from the edge of the penalty area, as "the best of his career". Noble captained the England U18 team. He was a member of the England U19 team that beat Serbia and Montenegro U19s 3–1 in the 2005 European Championship semi-finals, although they subsequently lost the final to France. Noble made his debut for the England U-21 team on 11 June 2007, coming on as substitute in the 82nd minute for Tom Huddlestone in England's 0–0 draw with the Czech Republic during the 2007 UEFA European Under-21 Championship, held in the Netherlands. He established himself in the starting XI for the remaining matches and scored twice in a dramatic semi-final penalty shootout against the Netherlands where England lost 13–12. On 11 September 2007, Noble scored his first international goal for the under-21 team against Bulgaria in a 2–0 victory, followed by two more against the Republic of Ireland on 16 October. Noble captained the U21s at the 2009 European Championships as regular captain Steven Taylor had to withdraw due to injury. The Young Lions ended the tournament as runners-up, losing 4–0 to Germany, with Noble playing his last match for the U21s. Noble is also eligible to play for the Republic of Ireland national side through his Cork-born grandparents. In August 2014, despite stating on numerous occasions about his ambition of playing for England at senior level, it was reported by the Irish Independent that he could be willing to make himself available for the Irish national team. In May 2016, Noble was granted freedom of the Borough of Newham for his services to the borough. Noble has been married to childhood sweetheart Carly since 2012. The couple have a son and a daughter. ^ a b Hugman, Barry J., ed. (2009). The PFA Footballers' Who's Who 2009–10. Mainstream Publishing. ISBN 978-1-84596-474-0. ^ "Mark Noble: Overview". Premier League. Retrieved 27 January 2019. ^ Richard Beech. "Why England should PRAY for penalties at the World Cup — and why we should take Mark Noble — Mirror Online". mirror. Retrieved 12 September 2014. ^ "West Ham hero Noble: Why I left Arsenal". Tribal Football. 26 December 2013. Retrieved 27 February 2014. ^ a b c "Mark Noble Profile". www.whufc.com. Archived from the original on 17 August 2012. Retrieved 11 October 2012. ^ a b c d e "Soccerbase: Mark Noble". Retrieved 12 September 2014. ^ "West Ham 1–0 Preston". BBC Sport. Retrieved 27 February 2014. ^ "Mark's Big Finish". whufc.com. 5 May 2005. Archived from the original on 21 September 2012. ^ a b c d e f g h i "Welcome to the Wonderful World of West Ham United Statistics — Mark Noble". www.westhamstats.info. Retrieved 27 February 2014. ^ "Noble joins Hull for three months". BBC Sport. 6 February 2006. Retrieved 27 February 2014. ^ "Cardiff 1–0 Hull". BBC Sport. 18 February 2006. Retrieved 27 February 2014. ^ "Mark Noble: Claret and blue, through and through" Archived 30 September 2007 at the Wayback Machine, The Independent on Sunday, 17 June 2007. Retrieved 17 June 2007. ^ ""Noble and Walton sign for Ipswich"". Retrieved 12 September 2014. ^ "Ipswich 2–1 Coventry". BBC. 12 September 2006. Retrieved 4 February 2010. ^ Lyon, Sam (6 January 2007). "West Ham 3–0 Brighton". BBC Sport. Retrieved 27 February 2014. ^ Fletcher, Paul (4 March 2007). "West Ham 3–4 Tottenham". BBC Sport. Retrieved 27 February 2014. ^ "West Ham United v Tottenham Hotspur, 04 March 2007". www.11v11.com. Retrieved 22 January 2013. ^ Sanghera, Mandeep (8 August 2007). "Birmingham 0–1 West Ham United". BBC Sport. Retrieved 27 February 2014. ^ ""Naive" Noble out for two weeks". Waltham Forest Guardian. 9 November 2007. ^ Chowdhury, Saj (30 January 2008). "West Ham United 1–0 Liverpool". BBC Sport. Retrieved 27 February 2014. ^ "Report: Manchester City vs West Ham United". espn.com. 24 August 2008. Archived from the original on 4 June 2011. ^ "Duo hammer out new deals". PremierLeague.com. 7 April 2009. Archived from the original on 11 April 2009. ^ Mikey Stafford. "Premier League: Wolves 0–2 West Ham United". the Guardian. Retrieved 12 September 2014. ^ Roopanarine, Les (4 November 2009). "West Ham 2–1 Aston Villa". BBC Sport. Retrieved 27 February 2014. ^ "West Ham midfielder Noble out after appendectomy". Associated Press. 2 November 2010. Archived from the original on 24 September 2015. Retrieved 28 February 2014. ^ Sanghera, Mandeep (2 April 2011). "West Ham 2–4 Manchester United". BBC Sport. Retrieved 28 February 2014. ^ "Barnsley 0–4 West Ham United". www.whufc.com. Archived from the original on 15 January 2016. Retrieved 27 February 2014. ^ "Noble voted Hammer of the Year". whufc.com. 30 April 2012. Archived from the original on 2 May 2012. Retrieved 1 May 2012. ^ Fletcher, Paul (19 May 2012). "Blackpool 1–2 West Ham". BBC Sport. Retrieved 27 February 2014. ^ "MARK NOBLE SIGNS NEW WEST HAM DEAL". www.dailstar.co.uk. 25 September 2012. Retrieved 25 September 2012. ^ "Hammers publish important research". www.whufc.com. 18 November 2013. Archived from the original on 8 December 2013. Retrieved 27 February 2014. ^ Hassan, Nabil (20 October 2012). "West Ham 4–1 Southampton". Retrieved 27 February 2014. ^ "11 January 2014, Cardiff City 0 – 2 West Ham — Match Report — Match — West Ham United". Archived from the original on 12 September 2014. Retrieved 12 September 2014. ^ "2013/14 Player Awards,". 5 May 2014. Archived from the original on 6 May 2014. ^ "West Ham 1–3 Southampton". BBC Sport. Retrieved 13 April 2015. ^ Burke, Liam (30 November 2014). "Noble sets Premier League Record for West Ham". EPL Index.com. Retrieved 30 November 2014. ^ "Mark Noble signs West Ham contract extension to 2020". BBC Sport. Retrieved 26 February 2015. ^ "West Ham 3–4 Bournemouth". BBC Sport. Retrieved 22 December 2015. ^ "Liverpool 0–3 West Ham United". BBC Sport. Retrieved 22 December 2015. ^ "West Ham skipper fumes at missed opportunity at Southampton". Newham Recorder. 8 February 2016. Retrieved 1 March 2016. ^ a b Lustig, Nick (29 March 2016). "West Ham captain Mark Noble scores in testimonial match". Sky Sports. ^ Steinberg, Jacob (27 March 2016). "West Ham's Mark Noble: I didn't want a testimonial and Upton Park to be half-empty". The Guardian. ^ "Noble — It couldn't have gone any better — West Ham United". Archived from the original on 31 March 2016. Retrieved 29 March 2016. ^ "Mark Noble says West Ham win at Boleyn farewell was 'written in the stars'". Sky Sports. Retrieved 11 May 2016. ^ "West Ham captain Mark Noble hits back at critics calling for him to be dropped". Retrieved 18 May 2017. ^ "Stat's A Fact - Noble: The 400 Club". whufc.com. 9 April 2017. ^ "Mark Noble". www.westhamstats.info. Retrieved 18 May 2017. ^ "Mark Noble to miss last two West Ham fixtures as he requires abdominal surgery". Retrieved 18 May 2017. ^ "Stoke 0–3 West Ham". BBC Sport. 16 December 2017. Retrieved 16 December 2017. ^ "Fans approach players during West Ham's defeat by Burnley at London Stadium". BBC Sport. 10 March 2018. Retrieved 17 March 2018. ^ Rowan, Paul (11 March 2018). "West Ham shame as fans invade pitch". The Times. Retrieved 18 March 2018. ^ "Mark Noble throws West Ham supporter to the ground during pitch invasion - JOE.co.uk". Retrieved 18 March 2018. ^ ""Noble cause"". Retrieved 12 September 2014. ^ "England held in Arnhem", TheFA.com match report, 11 June 2007. Retrieved 11 June 2007. ^ "Graft not craft the art for Noble". uefa.com. 16 June 2009. Archived from the original on 19 June 2009. ^ "BBC SPORT — Football — Internationals — Holland U21 1–1 Eng U21 (aet)". Retrieved 24 March 2016. ^ "Bulgaria U21 0–2 England U21 ". Retrieved 12 September 2014. ^ "Pearce considers Noble for captain's role". Waltham Forest Guardian. 9 June 2009. ^ "Lonergan could play for Republic". lep.co.uk. Retrieved 9 June 2009. ^ "Mark Noble: I will never give up on my England dream". Evening Standard. 14 August 2014. ^ "West Ham's Mark Noble ready to declare for Ireland — reports". Irish Independent. 29 August 2014. ^ Kat Hopps. "Freedom of the Borough honours presented to 'remarkable people'". Newham Recorder. Retrieved 21 May 2016. ^ "Noble loving it all". whufc.com. 6 July 2012. ^ "Games played by Mark Noble in 2004/2005". Soccerbase. Centurycomm. Retrieved 29 October 2014. ^ a b "Games played by Mark Noble in 2005/2006". Soccerbase. Centurycomm. Retrieved 29 October 2014. ^ a b "Games played by Mark Noble in 2006/2007". Soccerbase. Centurycomm. Retrieved 29 October 2014. ^ "Games played by Mark Noble in 2007/2008". Soccerbase. Centurycomm. Retrieved 29 October 2014. ^ "Games played by Mark Noble in 2008/2009". Soccerbase. Centurycomm. Retrieved 29 October 2014. ^ "Games played by Mark Noble in 2009/2010". Soccerbase. Centurycomm. Retrieved 29 October 2014. ^ "Games played by Mark Noble in 2010/2011". Soccerbase. Centurycomm. Retrieved 29 October 2014. ^ "Games played by Mark Noble in 2011/2012". Soccerbase. Centurycomm. Retrieved 29 October 2014. ^ "Games played by Mark Noble in 2012/2013". Soccerbase. Centurycomm. Retrieved 29 October 2014. ^ "Games played by Mark Noble in 2013/2014". Soccerbase. Centurycomm. Retrieved 29 October 2014. ^ "Games played by Mark Noble in 2014/2015". Soccerbase. Centurycomm. Retrieved 29 October 2014. ^ "Games played by Mark Noble in 2015/2016". Soccerbase. Centurycomm. Retrieved 30 August 2015. ^ "Games played by Mark Noble in 2016/2017". Soccerbase. Retrieved 29 July 2016. ^ "Games played by Mark Noble in 2017/2018". Soccerbase. Retrieved 16 January 2018. ^ "Games played by Mark Noble in 2018/2019". Soccerbase. Centurycomm. Retrieved 6 February 2019. Wikimedia Commons has media related to Mark Noble. This page was last edited on 13 April 2019, at 19:27 (UTC).